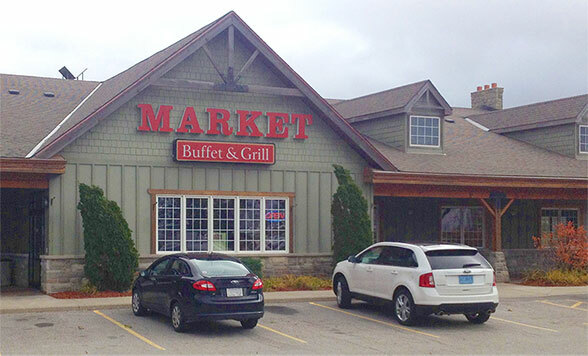 The Market Buffet is located at 147 Mapleview Drive West, tucked neatly behind Cora’s and A&W at the intersection of Veteran’s Drive and Mapleview Drive – make sure you look for it because it is very easy to miss. The Market is going on its eigth year of business and is doing better than ever. A cute little country-esque feel to the restaurant makes you feel like you are dining in an old home out in the country. The restaurant surely has a unique set-up: the buffet reaches from one end of the restaurant to the other, with cold foods on the left, hot foods in the middle, and all the desserts you could ever hope to consume on the right. It is decorated in wood paneling from ceiling to floor, has seating everywhere you look, and hung on the walls are beautiful photographs of Barrie before commerce overwhelmed it. Being a Buffet in a growing city is quite difficult, but I believe that the Market has shown some very big progress if you had ever dined at the restaurant in its early years of business. I noticed some cards placed on the windows above the buffet where the food options were written. The Market has recently undergone some changes concerning some of the items that they purchase. Most of their produce comes from local farms around Barrie and even throughout Ontario. This is an encouraging thought because you are able to tell exactly where your food is coming from and it shows that the owners are taking an interest in their customers health. 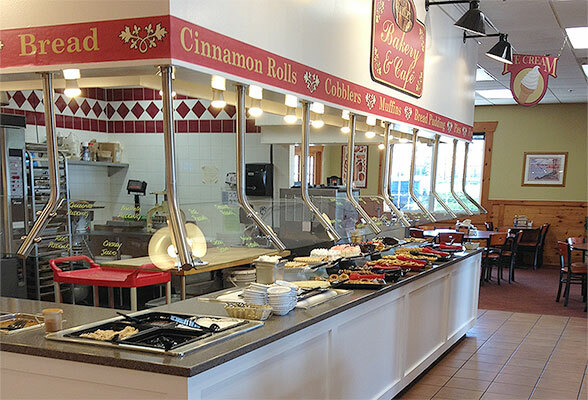 The Market Buffet is a restaurant that offers home-style foods: roasted & mashed potatoes, vegetables, fruit, pizza, tacos, soup (which is subject to change daily), pasta salads, meatloaf, potroast, wings, pasta (they have a Pasta station where you can make your own pasta on Wednesday and Saturday nights), and all you can eat steak (only Monday- Sunday for dinner). I wish I could say that this is the end of the list of options, but it’s not. The Market has “Theme Nights” throughout the week during the dinner hours: Monday is %10 Emergency Appreciation, Tuesday is half-price kids, Wednesday is Tastes of the World, Thursday is Barbeque Night, and Friday is Fish-Friday. The food options during the Lunch hour are slightly different than the Dinner menu. The night that I went there was Ratatouille (which is perfect for my vegetarian appetite), Jambalaya, and Cabbage Rolls. The Market has a rather extensive list of meal options available, it all depends on which night of the week you decide to dine there. My absolute favourite part of the Buffet was the desserts. They have these delicious little creations called Butterscotch Haystacks that were both crunchy and soft. They also have soft serve ice cream (which is a favourite of mine), and, if you ever come to the Market, please try the Brownies – you will not regret it. I do not like brownies most usually, but the Market has a special way of making you go back for seconds. The service seriously impressed me. 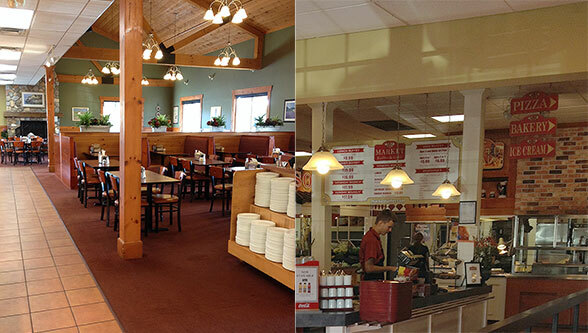 You can tell that you will be well taken care of during your meal from the moment you walk into the restaurant. The cashiers are very friendly and welcoming (this is where you get your drinks and pay for your meal before you sit down to eat). The servers go out of their way to ensure that you are having an excellent experience at the Market. They take away your dirty plates (you grab a clean one everytime you go up to the buffet for more food), and refill all of your drinks. You would not think that this is a very difficult task, but when you observe the servers working they have multiple tables needing the same thing all at once so they do a lot of running. Make sure you tip your server while you are here for their good service; it is just the same as every other restaurant, and it looks like they are doing a lot more running than servers that actually take your meals. The kitchen staff is also very kind and helpful, always asking you if you are okay or if there is anything they can help you find. Pricing is fair considering it is a buffet. You can dine during the lunch hours for under $15, and during the dinner hours for less than $25 per person. This is a very affordable restaurant with a lot to offer for the price. Overall, I had a very lovely experience here – the staff made my dining experience that much more pleasant. I will surely return to dine at the Market. Valerie Colangelo is a writer from Barrie. Read her blog at: www.accordingtovalerie.com and follow her on Twitter at @vcolang.